Cendol bar bukanlah cendol biasa! I ordered something here without any plans actually. I'm not a fan of durian and I don't eat durian. I came here with a friend of mine who was a durian freak and we decided to have a treat. 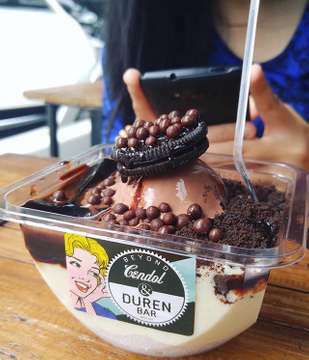 She ordered Ice dureon choco oreo and I ordered cendol oreo. First of all, it wasn't as crowded as I thought because this place is quite famous. Finding it isn't hard too since it's right in front of the stairs at food court. When our orders came, the smell of durian wasn't so bad and I was able to accept it. 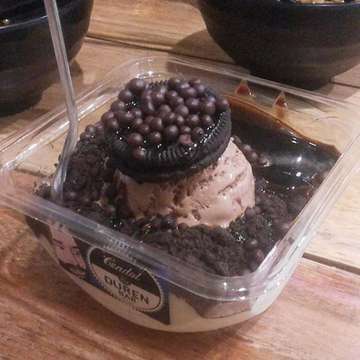 She said that it was really refreshing but the durian the chocolate was too strong until the durian taste and aroma almost disappeared, but she did say that it was good. Meanwhile, my cendol was delicious. It's very tasty, not as sweet as I imagined. A good thing because I can't stand something that's too sweet even though I have a sweet tooth. The price was okay. Hopefully they won't raise it. I would come back again if I'm in the mood of fusion Cendol.